American clarinetist and BG France Performing Artist MICHAEL DEAN "ClarinetMike" performs and teaches internationally and across the USA to consistent praise such as "world-class clarinetist and pedagogue," "consummate performer," "inspirational," "outstanding teacher," "super," "brilliant performer," and "one of the best clinicians I have ever seen." 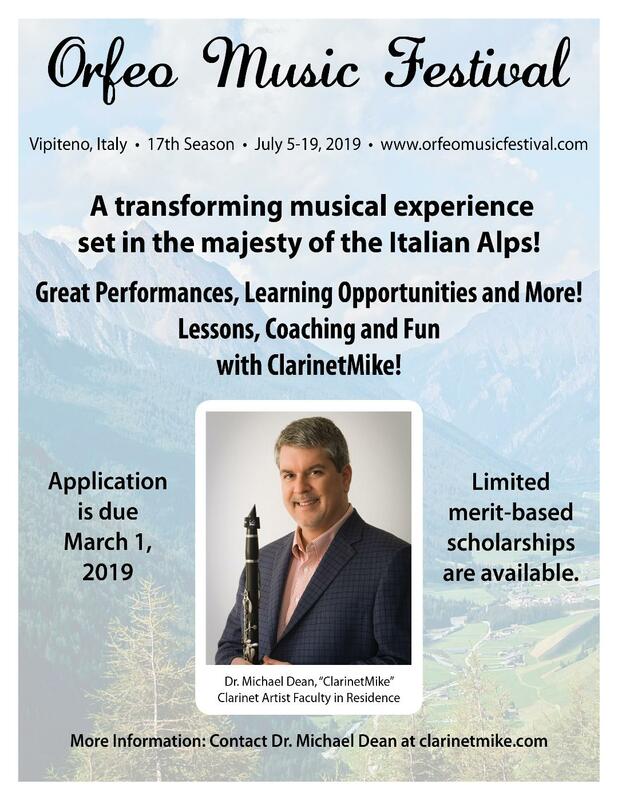 Dr. Michael Dean maintains a dynamic national and international profile with recent recitals and master classes in Italy, Spain, Iowa, Missouri, Louisiana, and Texas. In July, he returned to Vipiteno, Italy as Clarinet Artist Faculty in Residence at the Orfeo Music Festival 2017. He will tour Alabama and Texas in October with his Duo 35 (with saxophonist Todd Oxford) giving recitals and master classes, including a recital and presentation at the NACWPI National Conference 2017 at the University of Montevallo. Dr. Dean has appeared as a clarinet recitalist at Carnegie Hall and has a sustained record of recitals, clinics, master classes, and presentations at international (ClarinetFest), national (NACWPI), and state (TMEA/TBA) conferences and festivals. He tours as a solo recitalist, chamber musician, and clinician internationally and across the USA. His tour of England was highlighted by stops at the Royal Northern College of Music, University of Sheffield, Colchester Institute, and Liverpool Hope University. In the USA, he's given recitals and master classes at universities and other venues in 21 states, including tours of New York, California, Arizona, Florida, Nevada, and Texas: Eastman, Ithaca, Crane, CalArts, Cal State Northridge, San Diego State, Cal State Long Beach, Arizona State, Arizona, Northern Arizona, Florida State, Florida, Central Florida, South Florida, UNLV, Rice, University of North Texas, TCU, Baylor, Texas State, SMU, Texas A&M Commerce, University of Texas at Arlington, Sam Houston State and others. As a clarinet performing and recording artist, he has commissioned, premiered, edited, toured with, and recorded numerous new and lesser-known clarinet works. He is featured on New Media (YouTube) and five commercial CD's: Mysteries, Desertscape, Woodwind Music of Robert Fruehwald Volumes 1 and 2, and Red Mesa Trio. He is currently preparing another new CD, Postcards from Silver Lake. He has extensive experience as an orchestral, chamber, and orchestra pit musician: Abilene Philharmonic, Southwest Symphony, Nevada Symphony, Southeast Chamber Players, Red Mesa Trio and Duo 35. He recently performed for 11 years with the Paducah Symphony Orchestra. As "ClarinetMike," Michael Dean writes for his noted and widely-read "ClarinetMike Blog," clarinetmike.wordpress.com. The clarinet blog has been read in 150 countries on 6 continents. A recent Google Search listed his blog as the #1 clarinet blog in the world. He's also published articles in print journals such as WINDPLAYER, Southwestern Musician, NACWPI Journal, The Bandmaster's Review and online publications, such as Vandoren's widely-distributed WAVE e-newsletter. This web-page requires Adobe Flash Player to play music or display video. Unfortuneately, Internet Explorer 64-bit does not current support Flash. Please try running the 32-bit Internet Explorer or another browser such as Mozilla Firefox to listen to music and view video in this web-page. Presentation: "GO FOR IT! Master Class and Workshop on Music Preparation and Performance"
Thursday, November 17, 2016, 5 p.m. and 7:30 p.m.
August 14, 2016, 5 p.m.
August 5, 2016, 3:30 p.m.
Clinician: "CLARINET POWER! Upgrade with Powerful Clarinet Pedagogy"
Monday, January 25, 2016, 7 p.m.
© 2010-2017 Michael Dean. All rights reserved.